Bakeer Ganes takes over for Bob Bertucci, who resigned last year. WALBERT YOUNG TTN Coach Bakeer Ganes takes over Temple’s volleyball program after spending five years as an assistant coach at West Virginia. Bakeer Ganes, the new head coach of the women’s volleyball team, plans to rebuild a team that his former mentor, Bob Bertucci, once coached to seven Atlantic Ten Conference regular-season titles. As an assistant coach for five years at West Virginia University, Ganes was the top choice to fulfill the opening for the Owls’ vacant coaching position, according to the search committee, Athletic Director Bill Bradshaw said. Ganes takes over after the resignation of Bertucci, who served 16 years as the head coach and became the coach with the most wins in program history with 315. Bertucci, a three-time A-10 Coach of the Year, took the Owls to 14- straight conference tournaments prior to his final season. The Owls finished last season with a 4-25 overall record and were tied for ninth in the conference with a 1-14 mark in A-10 play. Ganes will begin to prepare the squad for the start of next season in the fall. Prior to his coaching career, Ganes studied under Bertucci during offseason summer camps in 2005 and 2006. Bertucci named Ganes a coordinator to help coach middle school and high school volleyball players at his camps in the Northeast and Southeast regions of the country. Ganes said he learned the basics from Bertucci before his start as an assistant coach at Cedar Valley College in Grand Prairie, Texas. He helped coach the Suns to a co-conference championship in the 2005-2006 season. At West Virginia, Ganes earned his master’s in athletic coaching education while serving for two years as a graduate assistant coach and then as a full-time assistant for the Mountaineers for three years. Ganes helped the Mountaineers finish 17-13 in 2009 and 15-15 last season. Over the years, Ganes established connections with club teams in “hot bed” recruiting places such as California, Texas and the Midwest. Ganes said his experience as the recruiting coordinator at West Virginia will be put to use as he scouts new talent for the Owls. “A lot of my former teammates are coaches now, so I’m going to use those connections to get some quality players to come to Temple,” Ganes added. Ganes, who started playing volleyball at the age of eight in Germany, said he still maintains relationships with the junior club and national programs in the country. 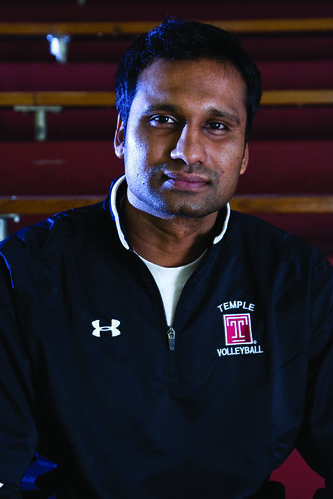 As a college volleyball player, Ganes attended Queens College, where he was a four-year letter winner and part of two conference championship teams. As an international player, Ganes said he is familiar with the paperwork process international players go through to become eligible to play in the United States. As Ganes makes the transition from coaching in the Big East, he said he finds his current position as a coach in the A-10 an “intriguing” challenge.